KATHMANDU, Oct 31: Learning lessons from its failure to book the public officials accumulating disproportionate property in the past, the Commission for the Investigation of Abuse of Authority (CIAA) has revised its modus operandi to investigate illegal property of government officials more effectively. As per the new working procedure prepared by the anti-graft body to deal with the illegal assets, an intelligence wing under the Property Investigation Department is active in secretly collecting the property details of suspected corrupt officials without their knowledge. 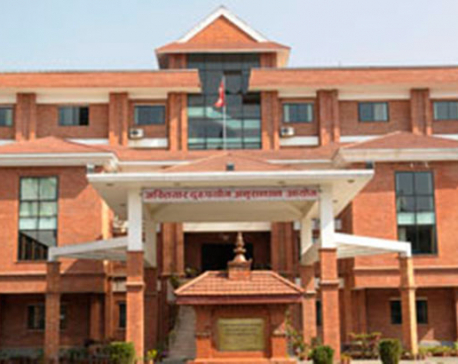 CIAA investigators summon the suspects and ask them to fill a 14-page form prepared to collect property details only after evidences are established against them. The new working procedure was introduced after the current CIAA Chief Nabin Kumar Ghimire took the charge of office as acting chief. Under the new working procedure, CIAA is silently collecting property details of high-profile politicians, security officials and civil servants. CIAA officials however did not divulge the details of the public officials kept under scanner, saying they won't tell anything without getting solid evidences to establish charges of accumulating disproportionate property. The anti-graft body was successful in taking action against dozens of high-ranking government officials and ministers shortly after it was empowered with new laws in early 2000. The then CIAA chief Suryanath Upadhyay had booked powerful ministers including Khum Bahadur Khadka, Jaya Prakash Prasad Gupta, Chirinjivi Wagle and several bureaucrats for amassing property without legal means. Following Upadhyay's retirement, the anti-graft body could not book high-profile people accused of accumulating illegal property. Upadhyay's successors—Lokman Singh Karki and Deep Bansnyat could not act tough against disproportionate property amassed by public officials, CIAA sources said. After being appointed as CIAA chief, Karki had summoned dozens of politicians, civil servants and security officials on charges of amassing property asking them to submit property details. Most of the accused had retaliated against Karki saying the summons were issued to silence them. Basnyat gave clean chits to most of the accused after the Supreme Court disqualified Karki from assuming office before completing his term. CIAA investigators believe politicians and bureaucrats register their property in the names of their relatives and take away the under-the-table earnings from Nepal. They say the new modus operandi will help them catch big fishes. “By adopting new modus operandi, we don't want to harm the dignity of anyone accused of corruption. But the corrupts will not be left free form their crime once their guilt is proven,” sad Spokesperson Dangal.